Our manual pull-down screens offer a cost effective solution for fixed installations. It is quickly installed and thanks to its pull-down mechanism can be extended and retracted as required. Whether installed in your living room, home cinema or office, the Ivolum pull down screen is an excellent choice. The screen can be stopped at different heights (approx every 10cm) using the handle so it can be adjusted to fit different formats. The built-in pull down mechanism works consistently and reliably. Decide where you wish to install the screen. It comes pre-assembled and can be mounted to the wall or ceiling in a few easy steps. The black back is impervious to light. The black borders increase the contrast. The type D fabric (diffuse reflection) has a gain factor of 1.0 and reflects light evenly. The projection always appears evenly on the screen with no light spots or less well-lit areas. 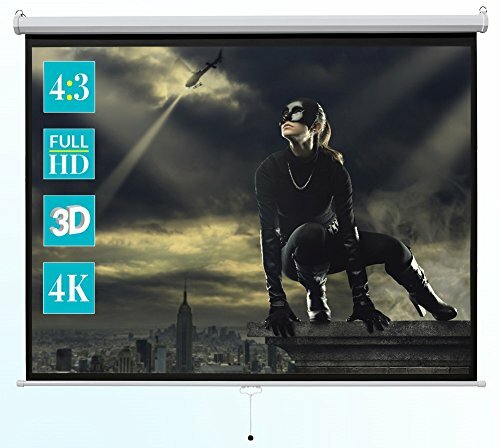 It is suitable for high-resolution content including 4K. The screen fabric is manufactured with a double-sided coating. The middle layer provides additional stability and excellent flatness. Gain 1.5 - ideal for home cinema or business presentations. Suitable for high resolution content including 4K.